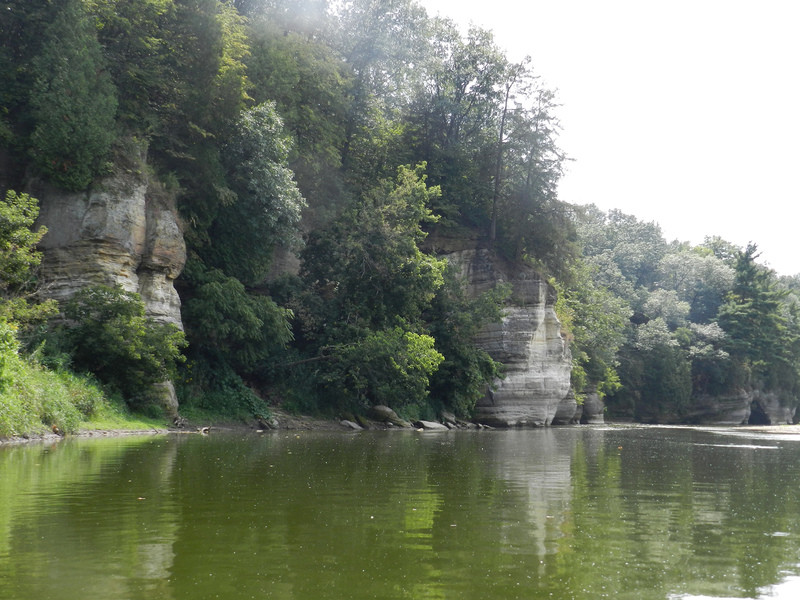 Good current, sandy bottoms and beautiful sandstone rock formations lining the entire way, the Fox River down here in Illinois looks nothing like its originating self up in Wisconsin by Waukesha. The two snags, however, are it feels like it takes forever to find the Fox and you will be extorted fees to use the traditional put-in and take-out options. Time: Put in at 1:15p. Out at 3:00p. Mother of invention, meet necessity. This trip was a last-minute whim made possible by my offer to pick up a friend at O’Hare flying in from Europe. Weddings, errands, bar mitzvahs, birthdays, you name it, I’ll have a kayak and a bike with me. Svob says, “Upon being asked to name the three or four most beautiful sections of river in Illinois, any knowledgeable canoeist would have to include this one.” It’s easy to understand why. It’s quite pretty and surprisingly (for Illinois) scenic. It’s also entirely comparable, if less dramatic, to either the Upper or Lower Dells section of the Wisconsin River. And since that is a 50-minute, toll-free drive with no fees to use landings, I would be less inclined to trek to Illinois for such an experience. But if you live or should you be traveling in/through/near north-central Illinois, then this trip makes for a magnificent paddle. I can sum up in three words why people paddle this trip: St. Peters sandstone. It’s everywhere and it’s truly beautiful. Amorphous, soft and tapered at the water-dripped tips while bulging wide in its striated midsections, sandstone on a river is my piece of heaven. Add to that some swift current, numerous sandbars and lots of wildlife and this trip has a real getaway feel to it. I will let the photos below do the rest of the talking. First, the fees. The traditional put-in for this section of the Fox is behind a bar called “The Last Resort” in the town of Sheridan, about 4.5 miles upstream of where I put in. Because of time constraints (and my inveterate frugality), I opted to put in at the halfway point (see map below). There are only two takeout options, both very good but both costing $5. The put-in cost at the bar also is $5. Add to that the $1.90 Rockford toll each way, and you’re already out nearly $15 before you have gotten your feet wet, to say nothing of the cost of gas. It’s true that the Highway 52 bridge does have a path leading down to the river that makes for a good put-in or take-out (but trust me, you don’t want to end your trip here. The best rock formations await downstream) but that doesn’t help much if you have a car and you need to park, for once again “No Trespassing” signs tell you in no uncertain terms what the score is. You can drive down the path to the river (tire marks show that others have done this) but it’s a little sketchy under the bridge. In addition to the tell-tale signs of shopping carts and mangy blankets, there was a skeletal structure of a ginormous wide-screen TV (absent of any screen or wires, just the framing and base…?!?). I wouldn’t feel confident leaving a car down there, even on a Wednesday afternoon (I just left my kayak there, the car at the landing and bike-shuttled between the two). If you head down there for this trip, learn from my experience and print out more detailed maps from Google or whatever internet mapping program you prefer. Or simply refer to the map below. My usually trusty Delorme Atlas & Gazetteer was unusually nondescript about road names, which lead me to a) getting quite disoriented and b) doing an unnecessarily long and out-of-the-way bike shuttle on a hot, windy day when I was already pressed for time. Quick vent… Why in the world do rural Illinois towns squander the opportunity to name their roads, deploying instead a lobotomy-numbing and boringly monotonous numerical system? For example, “N 3908th St” or “17000 S”? Seventeen-thousand?!? Good lord! how far away is ground zero? Indiana? What in the world is the point of this?? Numerical numbers make sense for urban grid areas (Manhattan is a case in point) but out here in farmland? Why not “Milk Morning Rd” or “Silo St,” “Cornhusker Dr” or “Churchsteeple Place”? The imagination could have a field day. “Handsoffmydaughter Dr,” “Boredfarmwife Butterchurn Rd” pert’ner the intersection of “Sonsoftoil” and “Tonsofsoil.” I digress. The last gripe I will mention is the silica plant in Wedron. As a curio, it’s quite interesting to take in, plus the juxtaposition of beautiful sandstone bluffs on the river with a huge factory is not lost on me. But it does spoil the effects (especially if the wind is blowing from the south) for there is an incessant sound of plant processing and rigs driving in and out of town hauling loads. At no point can you pretend you are alone in the world, which for me is a premium that comes with paddling. That said, I will now always think of the Fox River with each tiny pouch of “Do Not Eat” silica couched in a new pair of pants or duffel bag I might buy. It’s unlikely anytime soon. I personally begrudge paying what is essentially a toll to a private landowner to access what in my opinion is a public right-of-way, a river. Plus, as mentioned above, the Dells on the Wisconsin River are all this and then some. But also, if I were to make this drive down to Illinois again I would be more inclined to explore other alluring waterways (Covel Creek or the spectacular Vermillion River) in the same area. Furthermore, the takeout is right on the mouth of Indian Creek feeding the Fox River, and that creek looks very promising and publicly protected (though probably only in the springtime). So yes, this trip is definitely worth doing, but there are some caveats to consider first. The path leading to the put-in at Highway 52. Bathing beauties sunning it up. No trip is complete without a heron. Typical shoreline of modest rocks by Highway 52. The beginning of beautiful rock formations. Famous swallow holes of the Fox. Why yes, that is a ginormous silica processing plant downstream. The noise from this megaplant can be heard from miles upstream. If you want a close look and paddle past it, there is an alternate landing on river-left just after the bridge (where too you will have to pay a $5 fee). Take-out at Ayers landing: $5 fee to do so.